The bracelet on his wrist reads: “Proud to be Syrian.” For Aleppo native Anas Sharr, it’s a daily, defiant reminder of the war-shattered country he fled a few months ago. Home these days is a comfortable, low-slung recreational center outside Paris that abuts a lake and woods. Soon Sharr will be moving once again – to a grim high-rise where he will share a bathroom and kitchen with a half-dozen other refugees. “They welcomed us, they showed us good hospitality and helped us a lot,” he says in Arabic, when asked about his welcome in France since arriving in September. Still, Sharr claims French officials he met in Munich during the last leg of his marathon route from Syria promised more housing and financial aid than they delivered. Aleppo native Anas Sharr fled war-shattered Syria a few months ago and is among the first batch of 30,000 mostly Syrian refugees the French government says it will take in over the next two years. The 19-year-old student counts among the first batch of 30,000 mostly Syrian refugees the French government says it will take in over the next two years. When their bus rolled in here one late summer’s morning, they were greeted with coffee and crusty baguettes. Local residents wandered in carrying suitcases of clothes and toys. Volunteers played with their children and translated their stories to local officials, who signed them up for legal papers and French lessons. Today, the atmosphere is very different — and not just because of the chilly, rain-soaked weather. Since this month’s terrorist attacks in Paris that killed and injured nearly 500 people — and since officials say at least two of the assailants sneaked into Europe with the wave of asylum seekers — the French welcome mat for Syrians and other migrants is vanishing. Most of the assailants in the Paris attacks appear to be French or Belgian nationals. But authorities say fingerprint checks show at least two of the suicide bombers slipped in via the migrant route through Greece — the same route used by Syrian refugees like Sharr. Suspected ringleader Abdehamid Abaaoud, who was previously believed to have been in Syria, also reportedly slipped back into Europe unnoticed. “These individuals took advantage of the refugee crisis,” French Prime Minister Manuel Valls said in a TV interview last week. Nonetheless, the French government says its support for refugees remains as strong as ever. Noting that asylum-seekers will undergo tough security checks, President Francois Hollande said the government will go ahead with accepting thousands more in the coming years, adding that the country has a “humanitarian duty” to accept them. Some Syrians claim France's welcome remains warm. "Things are fine, there isn't any problem," said 42-year-old Abou Amar from Homs. Still, European divisions over accepting more refugees have only intensified since the attacks, a debate that also is playing out in the United States. During a meeting last Friday, EU interior ministers agreed to tighten border checks within the passport free Schengen zone. 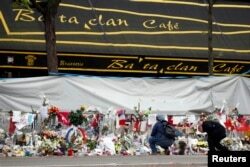 People mourn in front of the screened-off facade of the Bataclan Cafe adjoining the concert hall, one of the sites of the deadly attacks in Paris, France, a day before a ceremony to pay tribute to the 130 victims, Nov. 26, 2015. Individual nations have gone further. EU and UN officials have urged nations not to blame refugees for the Paris attacks. "We are deeply disturbed by language that demonizes refugees as a group," said Melissa Fleming, spokeswoman for the U.N. High Commissioner for Refugees. "This is dangerous and it will contribute to xenophobia and fear." In France, public opinion, which tilted in favor of accepting more refugees just a few weeks ago, is swinging back. So far, there has been no ill treatment of refugees in France, says Jean-Francois Dubost, head of Amnesty International’s Refugee and Migrant program. FILE - Wallerand de Saint-Just, French far-right National Front party treasurer and lead candidate for the regional elections in the Ile-de-France region, in Paris, France, Oct. 7, 2015. December’s regional elections in France are making it even more difficult. A new Ipsos poll finds the anti-immigration National Front surging ahead since the Paris attacks. 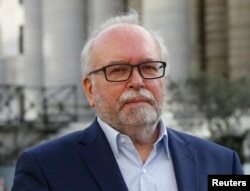 “If people had acted on what we’ve been saying, maybe we wouldn’t have had these 500 victims,” says Wallerand Saint Just, who heads the party list for the Front’s Ile de France region, which includes Paris. But for refugees like Sharr, there’s no going back. Instead, he thinks about heading on to the United States, where he says he has a brother. Or staying put in France.